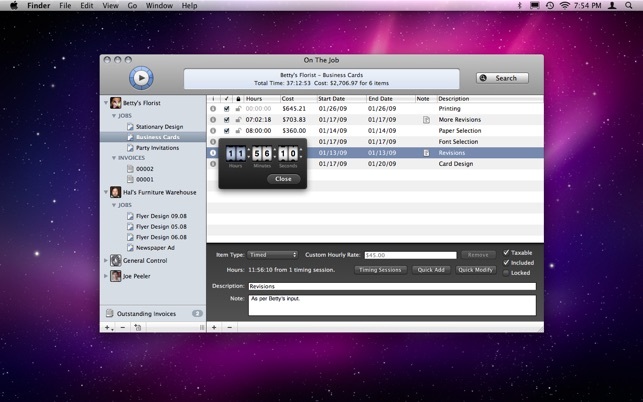 On The Job is designed to help you track your time and expenses, and bill your clients by quickly creating professional invoices. On The Job is straightforward and easy to use letting you focus on what's important. Jobs can contain four basic types of items: Timed, Fixed Cost, Quantity, and Mileage. These items correspond to line items on an invoice. If you need to quickly add or adjust times, you can use the Quick Add (for those times a client calls you at one in the morning and the last thing on your mind is starting a timer) and Quick Modify (in case you forgot to stop the timer when you started working on something else) buttons. 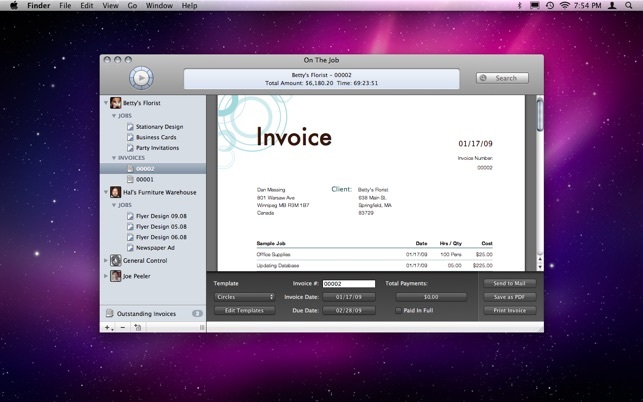 On The Job offers flexible invoice creation. 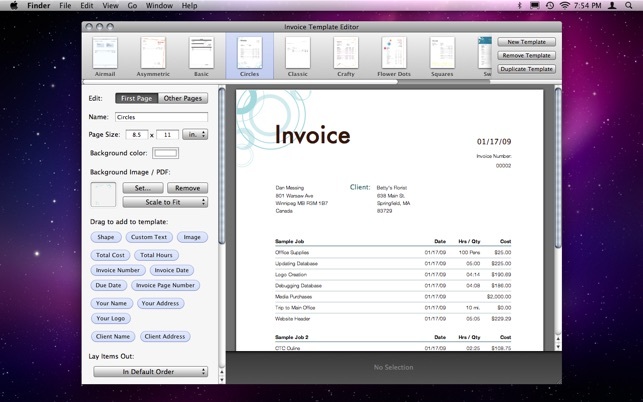 Several invoice templates are included, but the real power is revealed when you use the integrated template editor to create your own templates. Billing in multiple currencies? No problem, each client can use a different currency, and you can format it any way you like. The hourly rate set for the client is used by default, however this can be overridden for individual job items that need their own rate. If you've left the timer running and walked away from your computer, On The Job will alert you when you return and give you the option of removing the time from your job. See the status of your timer at a glance with the handy menu bar status item. Quickly start or stop the timer, or switch to a different task without ever bringing up the main window. Each Client contains its own fully customizable invoice number generation settings. You can increment an invoice number globally, or locally to that client. If you have multiple companies, or bill some clients through a company and others personally, On The Job can handle it. Create profiles with customized names, addresses, and logos. Assign profiles to your clients and automatically have the correct information appear in any invoices you create. On The Job is the most straightforward, powerful, and easiest to use time tracker and invoicing solution out there - give it a try! 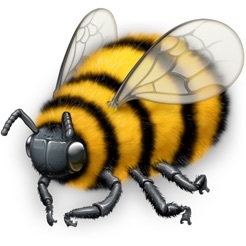 - Improved stability under Mountain Lion. - Added Retina Display support. - Fixed issues upgrading from previous versions. Die App ist genau das richtige um meine Arbeitszeiten für verchieden Kunden zu tracken. Dabei hat man auch genügend Einstellungsmöglichkeiten um andere Fälle abzudecken, wie pauschale Bezahlung, Stundentakt usw. Dazu kommt noch das automatische Generieren von Rechnungen, die auch im Design individuell angepasst werden können. Das einzige was noch wünschenswert ist, wäre eine Synchronisation zwischen verschiedenen Geräten. So muss man leider die Zeiten die man zum Beispiel am MacBook arbeitet auf seinem Hauptcomputer manuell nachsuchen.